We are pleased to introduce you to our inn keeper, Tom Kelch. Tom started with the Rehoboth Guest House along side the new owners beginning July 2013. He was born and raised in West Chester, PA and moved to Rehoboth Beach from Lehigh Valley, PA. In the past Tom worked for over 15yrs in management specializing in customer service, food safety, and bakery operations for a large corporation. He has been coming to Rehoboth since he was 16 yrs old and fell in love with the town. 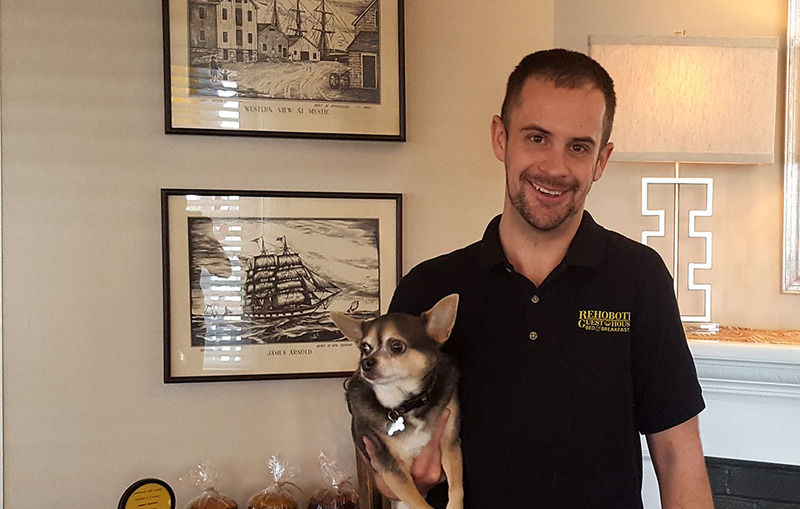 He knows all the ins and outs of Rehoboth and can help make your stay most enjoyable. He and his 4 legged companion Rambo will always be available for anything you need during your stay. His warm personality, love of people, sense of humor, and compassion for his job make him a perfect fit for the Rehoboth Guest House.